A ladder ko is a ko fight that depends on the success of a ladder. An example is shown on the left - starts a ladder ko at a, assuming that the five White stones can be captured in a ladder. A ladder ko is extremely biased against the player who is setting up the ladder, so much so that it is almost impossible for that player to win this ko. In the example, Black cannot hope to win this ko, because each move by White to escape the ladder is a local ko-threat. In almost every case, Black does not have so many ko-threats to counter White's local ko-threats. In order to win the ko, Black needs a ladder catcher nearby, for example around b. The solution to Igo Hatsuyo-ron Problem 90 is a ladder ko. 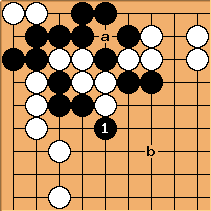 Almost an example of a ladder ko (as ko is only very near, but not affecting the ladder liberties itself) played by professionals, but most of all, the ladder is not working: broken ladder provided by Go4Go.net?. unkx80: I guess this guy was trying to use the ladder as a source of ko-threats.